Mountain Views! Two bedroom, two storey. FSC kitchen with large open lounge and dining area, balcony with outdoor setting. Linen, towels, Foxtel (over 65 channels including Fox Sports 1,2,3 & Fox Footy) & internet included. Rate is for two people.$10/$20 extra child/adult. Sorry, no pets in this unit. Mountain/Valley Views! 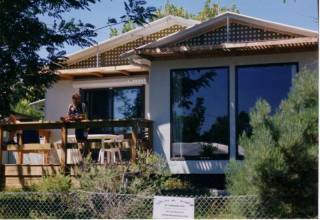 Two bedroom, two storey FSC unit. Extra large unit with spacious bathroom including spa/bath. Sweeping mountain views from top floor private balcony. Linen, towels, Foxtel (over 65 channels including Fox Sports 1,2,3 + Fox Footy) and internet included. Rate is per couple. $10/$20 extra child/adult. Sorry, no pets in this unit. You will find us overlooking the township of Mount Beauty. 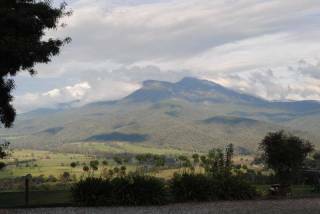 We enjoy views of Mt Bogong, Victoria's highest mountain, and the lush, green fields of the Kiewa Valley. We are 30 kilometers from the Falls Creek ski slopes, border on the Alpine National Park and an easy drive to the towns of Bright, Beechworth and Yackandandah. Whether your stay is for relaxation or exhilaration, we are here to ensure you have a great time. Alpenhorn has 7 fully self contained units. Six units are two bedroom/two storey with bedrooms & bathroom downstairs.The kitchen, lounge, dining area is upstairs with a private balcony off the lounge area. Our one bedroom unit is ground floor only. Units do not share a common wall, they are separated by a 0.75m "breezeway" This European design enhances sound proofing, heating/cooling and services to the units. The second floor balcony can remain private or by opening the privacy barriers, open the second floor to suit the needs of a large group. The units include linen/towels (need to bring pool towel), electric blankets, doonas, blankets, pillows, Flat panel HD TV with built-in DVD/CD player, FOXTEL (65+ channels), Internet access, clock radio, fans, ceiling fans in the two storey units, central heating, drying cupboards for ski equipment/clothes. Kitchens have microwave, fridge, pots/pans, cutlery/crockery/glassware including wine glasses, teapot/coffee plunger (loose tea and coffee supplied, as well as instant), electric frypan, toaster, kettle, detergent, tea towels, table cloth, paper towels, plastic wrap/alfoil. Guest laundry with dryer (we provide a free laundry service), fenced salt water in-ground pool, BBQ and garden setting. A port-a-cot and high chair is available at no cost. Stair barriers available in each unit of the two storey units. Pet friendly units are available with prior arrangement. Our units are named after local mountains. 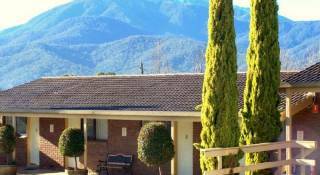 The two bedroom units of Arthur, Emu, Jim and Tawonga face the mountains. The one bedroom unit named McKay also has mountain views. Units Beauty and Cope look onto their own private garden. Alpenhorn is approximately 1.5 kms from the Mount Beauty township and half a kilometre from the Tawonga South shops. In Mount Beauty (1.5kms) you'll find a very good Foodworks Supermarket (open till 7pm daily), Commonwealth/ANZ/Bendigo Banks (with auto tellers), Green Grocer, Newsagency (with Tatts outlet), Real Estate Agents, Ladies Fashion Outlets, Butcher, Cafes and Bakery. Our office hours are 8am until 8pm but with prior advice we keep the office open for late arrivals. All children under 18 years are charged AUD 10 per person per night when using existing beds. One child under 18 years is charged AUD 10 per person per night in an extra bed.